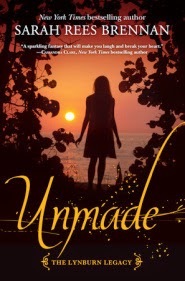 Unmade (The Lynburn Legacy Book 3) by Sarah Rees Brennan. Random House. 2014. Sequel to Unspoken and Untold. Review copy from publisher. I feel like I can't talk too much about the plot in Unmade because I don't want to spoil new to the series readers; and I don't want to spoil those who haven't read the final book yet. Short version: Kami Glass discovers that magic is real and her small English village is the center of a war involving powerful witches. And I use the term "war" deliberately, because important things are at stake. Lives are at stake. Should someone take a stand and risk their own lives and the lives of those they love? Are some lies OK to tell, to try to protect others? When can those lies be forgiven? I can also talk about characters more easily than plot, and I just love Kami and her friends and their growth during the series. I also love Kami's parents; the Lynburn Legacy series does a terrific job of incorporating adults into a teen-centered drama, in a way that is realistic yet keeps the spotlight on the teens. Plus -- there's a terrific mix of adventure, humor, love, friendship, twists, turns, and all the things that make a story worth reading. Because this wrapped up the series so perfectly, and because I want to be friends with Kami despite the risk to life and limb, this is a Favorite Book Read in 2014.